The concept of marketing a business has always been evolutionary. Market trends, current affairs, communication styles, even channels are always subject to changing influences and emerging technology. But, many argue that this evolution has never been as pronounced as it is in our current digital age. Social Media has moved from non-existent to ubiquitous in every walk of life in less than 20 years. Since its launch, more than 546 million professionals are now on LinkedIn. With this level of activity, brands need a strategy to make themselves heard, let alone realise the many benefits that come from an active social media presence. And there’s a sure fire way to make sure brands maximise any content they post: by bringing employees along as advocates, brands can dramatically increase the reach and engagement of their content and shares. The buyer journey is therefore impacted at an earlier stage as employees’ individual relationships and networks build credibility and authenticity around everything the brand is associated with. Crucial to the success of any employee advocacy program is planning. You need to understand your strategy and aims, as with any business initiative. It’s no good asking your workforce to share as much branded content as they possibly can. This ‘spray and pray’ approach will alienate contacts and certainly won’t tick the crucial ‘authenticity’ box. Start by breaking down your objectives to reflect your key business areas: sales (revenue generation, pipeline generation, conversions); employee engagement (survey results); recruitment (hires, referrals, cost of hires); marketing (volume of traffic to website, attribution tracking) and leave behind the vanity metrics, such as clicks and views. It’s critical to get this right because you need to be able to tie the program directly back to the business and the brand to understand the growth and depth of awareness that can be attributed to it. People share good content on social media. But it needs to be genuinely good (and not always cat or dog related). By creating and curating lively, up-to-date and varied content, you will encourage more of your employees to share things that bring your brand to the forefront of social media trending. How? 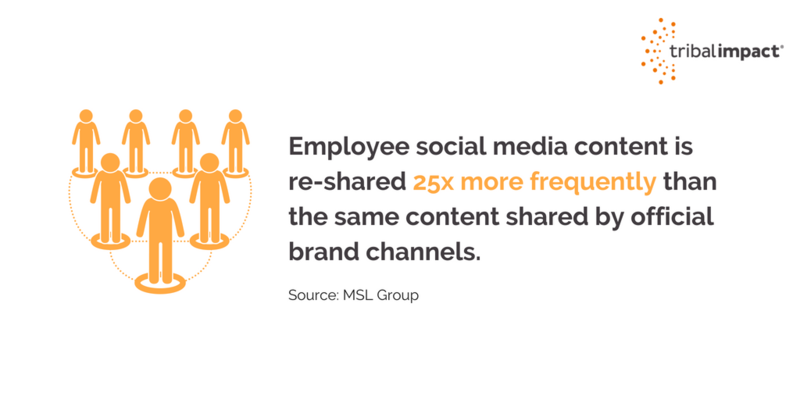 Well, content shared by employees receives, on average, 8x more engagement and is then re-shared 25x more frequently than the same content shared by official brand channels. Getting engagement from your employees for an official advocacy program is key to success. It’s no good if a few, already prolific sharers pick up on the idea and no one else follows. The key is to create a high volume of ‘brand chatter’. So, how do you convince people it’s worth their while? Well, you might be gathering by now that this advocacy lark often goes hand-in-hand with authenticity. So, you incentivize your people to take part by actually making it worthwhile. No smoke and mirrors, no empty promises. They will benefit by raising their own social profile and becoming known as an expert in their field, plus, the salespeople in your business will see an uplift in conversions. 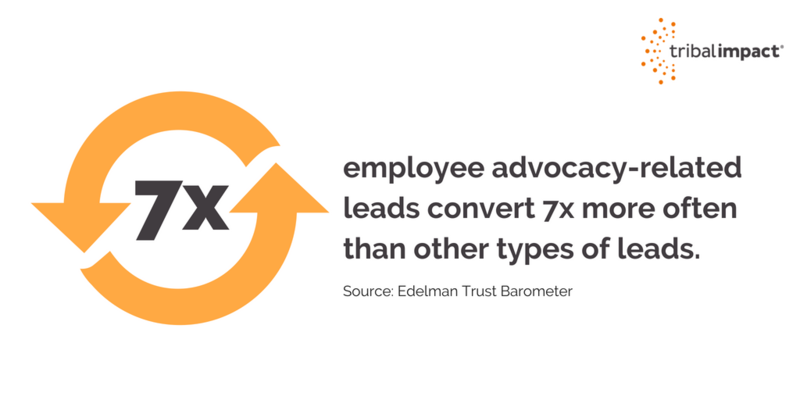 According to the Edelman Trust Barometer, advocacy-related leads convert 7x more often than other types of leads. Both these outcomes are great for the CVs of your employees and their future career potential. Plus, being involved in the program should help them to evolve their social media skills for use on a professional and personal basis. Be warned: an advocacy program that isn’t authentic and employee-led is possibly worse than total brand silence. Consumers these days do not want to be told what to do. They are leading their own buying journey. Every organisation will have natural social champions: those that are already sharing great content, building and nurturing a fabulous network of connections, even curating their own quality content. These are the people you need to celebrate. You should showcase their activity so others can learn from it or use them to carry out training. Launching an employee advocacy program is a great opportunity to include some fun aspects to encourage involvement. Contests for most reshared content, best post, best original content and so on create healthy competition among participants and help people to see what content gets the best response. All aspects of your employee advocacy program can be used as examples to continually train those involved. teams that do well in competitions could be offered extra training to improve their social media skills further – something that will benefit them on a professional and personal level and which therefore becomes another benefit of the program. take our Social Impact Quiz to identify where your employees sit in our Social Media Maturity Model. In summary, by implementing an employee advocacy program, brands almost certainly benefit from increased brand awareness, better quality leads, improved employee engagement and a better pick of top talent for their future workforce. Being able to nurture relationships that guide the buyer to your product or service at as early a stage as possible is the new differentiator. Social media is noisy but there’s no need to shout when you have a crowd of advocates ready and willing to amplify your brand message perfectly well.